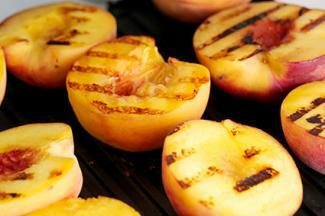 Roast or grill the peaches: Heat oven to 425 degrees. Lightly coat a baking pan with cooking spray or, if you want grill marks, use an oven-safe grill pan (one with ridges) lightly coated with cooking spray. When the oven is hot, place the pan of choice in the oven for 5 minutes so it is hot when you add the peaches. While the pan is heating, in a large bowl, gently toss the peach halves with lemon juice. Add the sugar and toss again. Arrange halves cut-side down in the prepared pan and roast for 10 minutes. Flip the peaches over and roast an additional 10 to 15 minutes or until the peaches are soft and caramelized. If the juices in the pan begin to burn, add a little water and cover the pan loosely with foil. Remove from oven and place on individual plates or a serving platter. 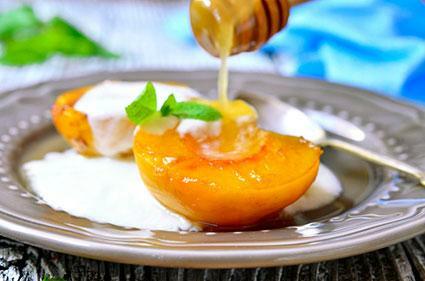 Serve: Drizzle each peach half with 1/2 tablespoon honey. Whisk together the yogurt and cinnamon and place a dollop in the center of each peach half. Brush the cut side of 8 pitted peach halves with a total of 1 tablespoon good-quality olive oil and place on grill, cut side down. Grill until golden brown and caramelized. This will only take 2 to 3 minutes so watch the peaches carefully. Turn the peach halves over and grill an additional 2 minutes or until warmed through but not mushy. Remove from grill, place on individual serving plates or a platter and drizzle with a total of 4 tablespoons of honey or let your guests drizzle on as much honey as they like.